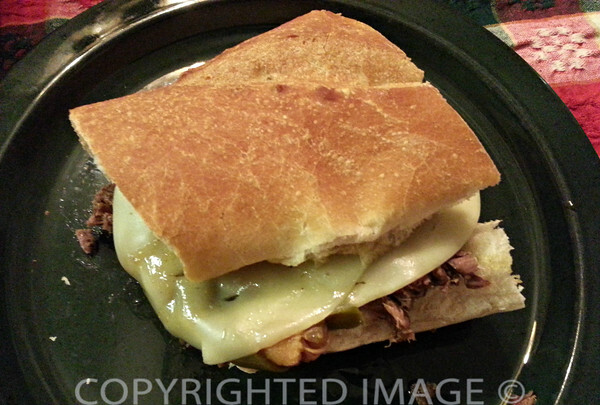 Homemade Italian Beef Sandwich – Italian Beef is one of those regional food specialties I could never get tired of eating. Have you ever traveled or spent even a short amount of time in Pittsburgh? Then there is a good chance you’ve heard of and eaten a Primanti Brothers® sandwich. Spent any length of time in Chicago? Even a weekend? This Is Not A Primanti Brothers® Sandwich! Shame on your host if they did not take you to the nearest Buona Beef® or Portillo’s® for Italian Beef! 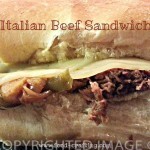 Italian Beef is a huge, very messy beef sandwich (when ordered “wet”) with an equally huge and unforgettable flavor. In Chicago, there are as many variations of the beef sandwich as there are places to order it! What is a wet Italian Beef sandwich? One that is dripping with the roasting pan juices! Messy indeed but how difficult is it to wash your hands when you know you can’t eat another bite? Until that time, just use a napkin or two. I’ve been trying to duplicate the taste and flavors at home – with some success. This recipe was prepared on the spur of the moment. As a result, some of the required ingredients were overlooked. We were so hungry that we did not even add the hot giardinara to the sandwich. Nor did I wait for it to cool before slicing the meat…or pick the right kind of bread. Nonetheless, the essential flavor was there. Plan on more than one napkin per person during the meal. Maybe a bib. Needless to say, I will continue to tweak the recipe until I can close my eyes and imagine myself on Ontario Street near the Navy Pier. A different cut of beef – probably eye of round. Plan ahead and allow the beef to cool a little so it can be sliced easily. Use a crusty loaf of Italian style bread. What I really need are sandwich rolls from Turano®! 4 to 5 cups of rich beef bouillon – heated to a slow simmer. 1 package of Provolone cheese. Sprinkle the beef with the Italian seasonings – one pack per side. For added flavor, I first seared the roast on all sides. Place fat side down in roaster and surround the meat with the sliced onions and green pepper. If you did not sear the meat first, add a sprinkling of olive oil to the bottom of the Dutch oven or crock to prevent the seasoning from burning. Roast the meat at 350 degrees for about 45 minutes. The onions and peppers should be fragrant but not burned. Add half of the bouillon to the roasting pan. Cover tightly. Roast for 1 hour, basting on a regular basis. After 1 hour, add the other half of the broth. Cover again. You want the roast to be fork tender. Drain a jar of Gardiniera. Add it to the pan juices. Heat through and ladle onto the meat along with the onions and green peppers for a “wet” Italian Beef. When using a slow cooker instead of a cast iron Dutch oven, set timer to 4 hours on High or 6 hours on Low. I made this version of the Italian Beef in a cast iron Dutch oven. With a few adjustments, it can easily be prepared in a slow cooker. Use Louie’s Italian Beef Seasoning for the richest gravy flavor! Adjust the cooking time to a minimum of 4 hours. Add the Giardinara to the pan juices just before serving. All you need to do is heat it through. Slice the meat as thinly as possible. Add a generous amount to one side of the bread, ladle some of the onions, green peppers and Giardinara mixture over the meat, top with a couple slices of Provolone. Ecco! Dinner! More slow cooking Comfort food recipes! 1 This Is Not A Primanti Brothers® Sandwich! Oh my gosh! My mouth is watering just looking at these. 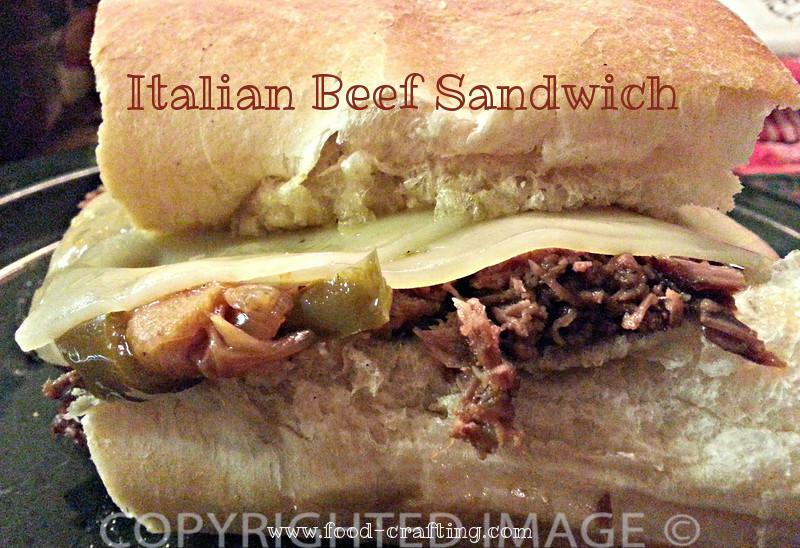 As an Italian, yes, I LOVE Italian beef sandwiches and will definitely have to add this one to my list to make at home. Thank you!